Summary: GW (real name, George Washington) has been stuck in his hamster cage for three months, two weeks, and one day. He and his friends, Barry the bunny and Biter the ferocious guinea pig used to be the Furry Fiends until they were captured and turned into classroom pets. As the story opens, GW has just figure out a way to unlock the cage. At the end of the school day, he makes his break and goes off in search of his companions. To his dismay, Barry seems pretty happy in first grade, and Biter has completely gone over to the dark side of kindergarten, calling herself Sunflower and practicing yoga to handle her anger issues. 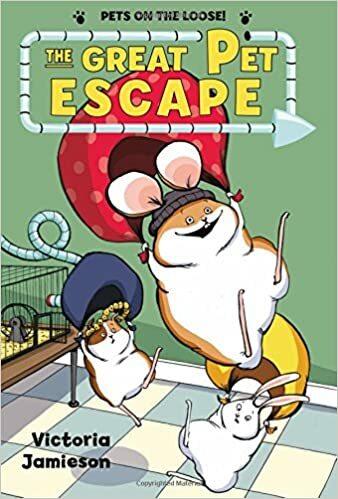 GW finally convinces them to return to their previous life, but their plans are interrupted by Harriet, the fourth grade mouse, leading an army that includes the fifth grade snake and ten more mice (or wait, is it nine and a well-fed snake?). War breaks out in the halls and cafeteria of the school, and a single food fight could change the course of class pet history forever. 64 pages; ages 6-10. Pros: Victoria Jamieson is a genius. Roller Girl was a Newbery winner and one of my favorite graphic novels of 2015. Now she’s gone in a totally new direction with a hilarious new graphic. Unlike some “humorous” kids’ books that just seem silly, this one had me laughing out loud on every page. Cons: I can’t decide which sequel I want to see first…Roller Girl 2 or another installment of Pets on the Loose.